A ceremony was held on Monday, April 8 at the Women’s Eastern Reception, Diagnostic and Correctional Center in Vandalia to mark the annual National Crime Victims’ Rights Week which is April 7-13 this year. “Honoring Our Past. Creating Hope For The Future.” is the theme of this year’s annual event. Restorative Justice is a victim-focused approach to criminal justice. The emphasis is on restoration: restoration of victims; restoration of communities; and restoration of offenders. The Department’s Restorative Justice initiatives encourage offenders to reflect on the harm caused by their criminal activity and make restoration to victims, the community and their families. Two core practices within the Restorative Justice program that help offenders reflect on their crime and the harm caused are Impact of Crime on Victims Class and reparative activities. The week and activities throughout the week are geared to reaching those goals. Autumn Smith, an offender at WERDCC, was the master of ceremony at the event on Monday. A welcome address was given by FUM Bill Morgan and a prayer was offered by Chaplain Tommy Barnhart. The main guest speaker on Monday was Marianne Asher-Chapman, co-founder of Missouri Missing. Her 28-year-old daughter, Angie, went missing on Nov. 1, 2003. It was discovered that she was murdered by her husband. He was sentenced to seven years for the crime of manslaughter and only served four years of that term. Another guest speaker was Amy Harrell, Court Advocate of Our Safe Place. 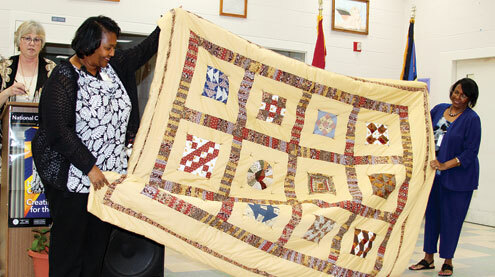 The WERDCC Restorative Justice program offered a presentation and a quilt was presented to Joyce Holman, acting president of the Concerned Citizenry to Save Lincoln School, which is in Vandalia. Closing remarks were offered by Paula Fletcher, CCM II, Restorative Justice/ICVC Coordinator for WERDCC.